The 2017 Keith and Elisabeth Murdoch Travelling Fellowships, worth $75,000, were awarded last night to four University of Melbourne graduates from the Victorian College of the Arts and Melbourne Conservatorium of Music (VCA & MCM). Awarded biennially to theatre, music and visual arts graduates, the Fellowships were established in 1994 by the late Dame Elisabeth Murdoch AC DBE to enable young artists to travel and study overseas in the early stages of their careers. Dame Murdoch’s granddaughter, Julie Kantor, presented the awards last night at the Margaret Lawrence Gallery on behalf of her grandmother, saying the Fellowships were created to help students become “artists of the world”. “It seems to me, and certainly to my grandmother, that an essential feature of the artist at any stage in their career, is to find compelling means of creating a bridge between the private world of feeling and insight, and a public world that has an enormous need for inspiration and understanding,” Ms Kantor said. Dean of the VCA & MCM, Professor Barry Conyngham, said providing young artists with international travel opportunities was of benefit to Australian culture more broadly. “Travel can provide emerging artists, musicians and performers with inspiration and connections that last well beyond the initial moment, and indeed continue to inform their creative development throughout their careers. As consumers of culture, we all stand to benefit from that,” he said. 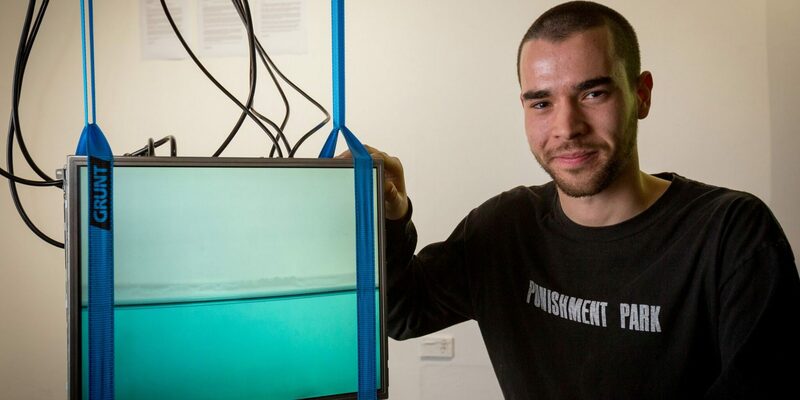 The main $25,000 Prize for Visual Art, judged on the day by a panel comprising Acting Head of VCA Art Dr Kate Daw, multidisciplinary artist Nicholas Mangan and Director of Gertrude Contemporary Mark Feary, went to Trent Crawford, who graduated from the VCA in 2016, for his video installation work Liquidity. Crawford’s work, along with the other shortlisted works for the visual art fellowship, will be on display at the 2017 Keith and Elisabeth Murdoch Travelling Fellowship Exhibition in the Margaret Lawrence Gallery (40 Dodds St, Southbank) until 5 August 2017. Trent Crawford, B. Fine Arts (Visual Art). Born 1995, Crawford lives and works in Melbourne. Interested in dissecting images and technology to explore them in a passive state, Crawford’s work focuses on entering the in-between moments in time where the subject or material exists in a state of lapse; often with its function usurped or absent. By disassembling, restructuring and repurposing new media, he calls to question how the framing devices of screens and filters are active in the construction, fragmentation and degeneration of the image. Award of $25,000. Eugyeene Teh, M. Production (Design). Teh has worked with mainstage companies, earning him Green Room Award nominations for both his debut works; Endgame at MTC and Meme Girls at Malthouse. Last year, he worked on Straight White Men (MTC), In Between Two (Sydney Festival with William Yang and Annette Shun Wah), Lady Eats Apple (Back to Back Theatre) and Blaque Showgirls (Malthouse). Award of $15,000. Troy Rogan, B. Fine Arts (Contemporary Music) (Hons). Rogan is a Melbourne-based composer, orchestrator and cellist, who brings his passion for making meaningful, engaging music to each project. He draws his inspiration from the art of storytelling, with a fascination of the parallel that various musical languages can impart. Award of $20,000. Banner image: Trent Crawford with his video installation work Liquidity. Photo: Sav Schulman.